We all are looking to be "green". Here is a beautiful step in that direction! 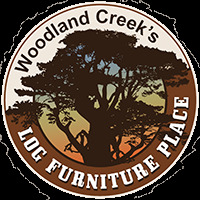 Environmentally friendly, all logs are harvested from dead-standing Lodgepole Pine Groves. Once harvested the logs are skip-peeled using time honored hand hewning with old-fashioned draw knives. The stock picture is not the actual lamp that you will receive. Mother Nature grows each tree differently so no two lamps are ever the same.